Hitting the road, the shops or the office, the MINI Two-Tone Totepack is a stylish one-stop solution for carrying all your essentials. It has an external, padded laptop compartment concealed in the back and another one inside next to the unlined, Island colored, zippered main compartment. 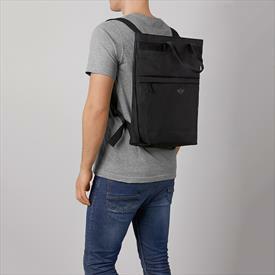 Additionally to the decorative webbing details, it has optional backpack straps that can be stowed inside as well as hand-held straps. A tonal MINI Wing Logo rubber print embellishes the front of the totepack.